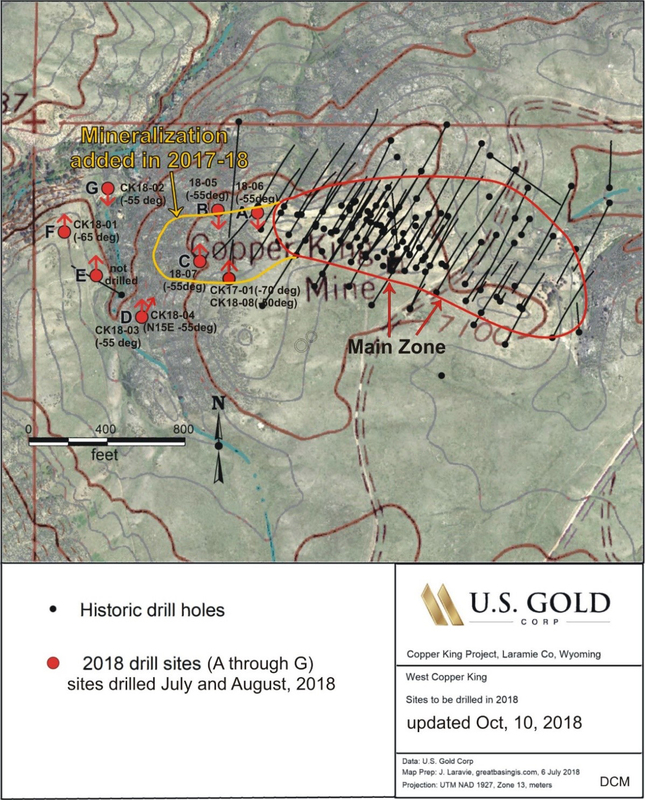 U.S. Gold Corp. completed an eight-hole, 2018 Fall drill program that was designed to further assess the westward extension of the Copper King deposit, that was initially intersected within the 2017 step out hole, CK17-01rc. 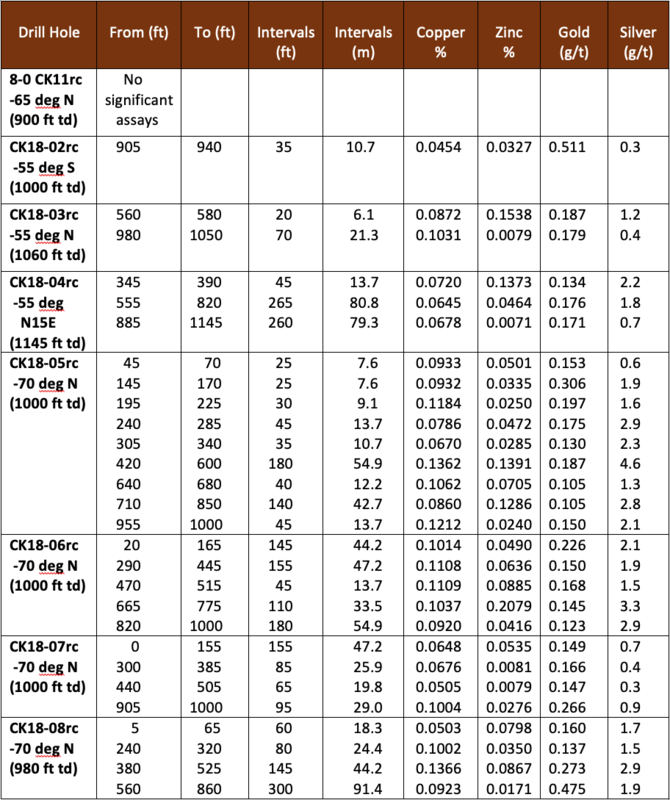 The 2018 drill program was successful in confirming this extension, encountering multiple, thick zones of copper, gold, zinc, and silver mineralization in five of the eight drill holes (click here for drill results table). The thick mineralization zones occur within a quartz, biotite schist within a zone of about 200 meters long, east-west dimension, and at least 120 meters wide, north-south, and to depths similar to the historic modeled deposit (see drill plan map). This new mineralization also appears to remain open to the south, and potentially to the north. U.S. Gold Corp. is building an expanded exploration model for the Copper King deposit. This model is designed to look more thoroughly at the deposit, especially with respect to its boundaries, internal high-grade zones, and the other metals of value which appear to be present. With this new model in hand, additional exploration efforts to enlarge and prospectively enhance the deposit value will be conducted. Since 1938, at least nine historical (pre-U.S. Gold) drilling campaigns, by at least seven companies plus the U. S. Bureau of Mines, have been conducted at Copper King. The most recent drill activity was in 2007 and 2008 when Saratoga Gold completed 35 diamond core holes totaling 7,762m. Prior to Saratoga, 96 known drill holes for an approximate total of 11,898m were completed on the Copper King property. 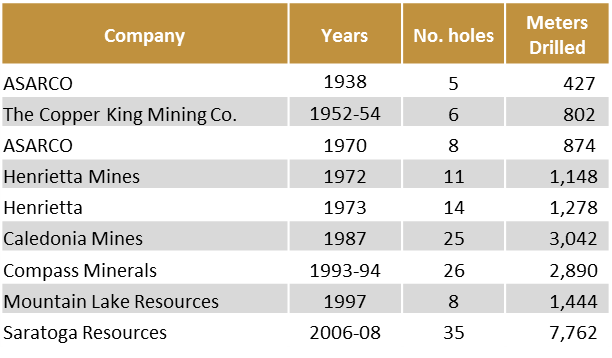 There are only limited, third-party references to four of these historical holes, six other pre-Saratoga holes are outside the resource area.